Grave Digger is a German heavy metal band formed by Chris Boltendahl (vocals), Peter Masson (guitar), Willi Lackmann (bass guitar) and Albert Eckardt (drums) in 1980 in Gladbeck, a small town in Germany. Grave Digger's famed debut album "Heavy Metal Breakdown" in 1984 already produced some undying classics, such as the true Grave Digger anthem "Heavy Metal Breakdown" and the powerful ballad "Yesterday". Grave Digger's famed debut album "Heavy Metal Breakdown" in 1984 already produced some undying classics, such as the true Grave Digger anthem "Heavy Metal Breakdown" and the powerful ballad "Yesterday". After their second studio album "Witch Hunter" (1985) was completed, Eckardt left the band and was replaced by C.F. Brank. After the third studio album "War Games" was released in 1986, the guitarist Peter Masson departed from the band, his place to be taken by Uwe Lulis. In addition, the band changed their name from Grave Digger to Digger and their style changed from heavy metal to hard rock according to such bands as Scorpions, Bon Jovi and Van Halen. This concept, however, was a drastical flop, hence why the frontman Chris Boltendahl announced the end of their career as a band after Digger's album "Stronger Than Ever" was released in 1987. However, the band returned in 1993 with the comeback album "The Reaper". Grave Digger now consisted of Chris Boltendahl, Uwe Lulis and two new members, Tomi G?ttlich (bass) and J?rg Michael (drums). "The Reaper" was a "back to the roots" album with the band's name being Grave Digger again and the style being heavy metal. On the top of that, a compilation entitled "The Best of the Eighties" was released along with the new album to represent the earlier songs of Grave Digger. The EP "Symphony of Death" been released in 1994, J?rg Michael left the band and was replaced by the new drummer Frank Ullrich for the upcoming tour. He also played the drums on Grave Digger's album "Heart of Darkness" (released in 1995). Ullrich didn't stay with the band for long though, as the year 1996 saw the coming of their new drummer Stefan Arnold, who has been playing the drums in Grave Digger ever since. The year 1996 also saw the beginning of Grave Digger's famous "The Middle Ages Trilogy", which consists of three concept albums: Tunes of War, Knights of the Cross and Excalibur. While "Tunes of War" is the first part of the trilogy dealing with Scotland's long fight and several attempts for independence, the second part "Knights of the Cross" (1998) tells the historical tale of the crusades and more specifically about the rise and fall of the Poor Fellow-Soldiers of Christ and of the Temple of Solomon (more commonly known as the Knights Templar). Knights of the Cross also introduced Jens Becker as the new bassist, and he has been the Grave Digger's bassist ever since. The trilogy was completed in 1999 with the final part, "Excalibur", which is about the myth of King Arthur and his Knights of the Round Table. The world tour supporting this trilogy officially introduced a keyboardist for Grave Digger for the first time (he had been working with the band since Tunes of War however) - his name was Hans-Peter Kratzenburg and he thus became a permanent member of the band. During live shows and in promotional pictures Kratzenburg is often seen dressed up as "The Reaper" character. In the year 2000 Grave Digger celebrated their 20th anniversary with a concert consisting of various old and new Grave Digger songs. This concert also ended one chapter as Uwe Lulis parted ways with the band. A new guitarist, Manni Schmidt, was found. The guitarist and record label having been changed, Grave Digger released a self-titled album called "The Grave Digger" in the year 2001. Many consider this album to be the darkest and heaviest Grave Digger record so far. Its songs were inspired by the works of Edgar Allan Poe. Next year brought the first live release of Grave Digger - "Tunes of Wacken" was released both in CD and DVD format. The next studio concept album appeared in 2003. "Rheingold" dealt with the opera "Der Ring des Nibelungen" by Richard Wagner, which is based loosely on characters from the Norse sagas and the Nibelungenlied. After the world tour that followed the release of "Rheingold", a new studio album called "The Last Supper" occurred in 2005. "The Last Supper" isn't wholly a concept album, but many songs deal with the last days of Jesus. To commemorate the 25th anniversary of Grave Digger, the band released a live DVD & CD recording of a concert in Sao Paulo, Brazil. It was entitled "25 to Live". In the next year an EP entitled "Yesterday" was released. It consists of a remake and an orchestra version of the Grave Digger classic "Yesterday" (originally released on their debut album), a cover of Led Zeppelin's song "No Quarter" and a new original composition "The Reapers Dance". In the year 2007 Grave Digger released the studio album "Liberty or Death". On October 8th 2007, the band revealed Thilo Hermann (ex-guitarist of Faithful Breath, Risk and Running Wild) as their second guitarist. This marked the first time for Grave Digger as a six-member band and with two guitarists. Grave Digger also signed a record deal with a new label called Napalm Records, and with this enforced line-up Grave Digger brought up two recordings: "Pray" EP was released on 28th of November 2008, and the studio album entitled "Ballads of a Hangman" was released on 9th of January 2009. The "Pray" EP contains four songs, one being an extended version of the song "Pray" (the regular version is found on the Ballads of a Hangman album), while the other songs of the EP are a cover version of Mot&ouml;rhead's classic tune "Overkill" and two new original compositions. 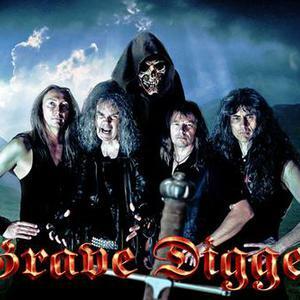 However, shortly after "Ballads of a Hangman" was released, Grave Digger announced to part ways with Thilo Hermann, explaining that it was too difficult for a sixth member to become integrated to a well-attuned team. Differences in the musical aspects were also being mentioned as one factor for separating from Hermann. In addition, soon after Hermann's departure many disagreements also appeared between Manni Schmidt and Chris Boltendahl, and this caused also Manni Schmidt to exit from Grave Digger in the Fall of 2009. For the rest of the shows in 2009, Grave Digger replaced Manni with guitarist Axel Ritt (from the German heavy metal band Domain), who afterwards became an official member of the band. Since mid-May through mid-July 2010, Grave Digger was working on the new album. The album - entitled "The Clans Will Rise Again" - was released on October 1, 2010 via Napalm Records following a North American release soon after. The album is a loose sequel to their previous concept record "Tunes of War". While not a concept record itself, the album will serve as a sort of biopic of Scotland, its mysticism and its people. In August 2010, Grave Digger performed their 30th anniversary show in Wacken Open Air. In this concert, the band played Tunes of War, their most successful album to date, in its entirety. The show saw special guest appearances from Doro Pesch, Hansi K?rsch, Van Canto and Baul Muluy Pipes & Drums. The concert was released on DVD and CD entitled "The Clans Are Still Marching" on March 4th 2011, along with a new EP entitled "Ballad of Mary", which contains re-recorded versions of The Ballad of Mary (Queen of Scots) and Rebellion (The Clans Are Marching) (off "Tunes of War") as well as an unplugged version of the former and instrumental versions of Highland Farewell and Coming Home (off "The Clans Will Rise Again"). The EP also features Doro Pesch and Hansi K?rsch as special guests. A number of compilations have also been released, such as "Lost Tunes from the Vault" and "Masterpieces".